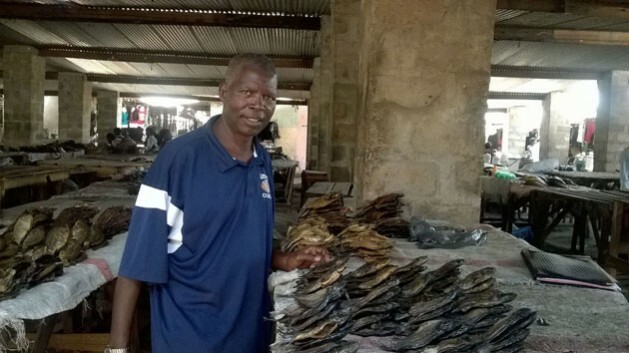 MONGU, Zambia, Nov 12 2015 (IPS) - Hadon Sichali has been in the fish trade for over 22 years. But he says only now does he feel a true businessman—but why? “Because I now make reasonable income after struggling for so many years,” said the 55-year-old entrepreneur of Mongu, Western Zambia. Until he was recently introduced to improved post-harvest handling techniques, Sichali, one of the retrenchees under the infamous IMF imposed Structural Adjustment Programme, struggled to break even in his business. However, he now earns as much as 5,000 kwacha (417 dollars) per month from a paltry 700 kwacha (58 dollars) that he used to earn on average. “Over the years, I have just been making enough for my family; it has been a subsistence kind of trading – from hand to mouth. But I would say that since we met WorldFish and the CultiAF people, we have reduced our losses through improved post-harvest handling such as salting. My capital has grown and I have even diversified into rice and groundnut business,” Sichali told IPS. Sichali is one the people in the fish value chain who are working with researchers in a newly launched project on post-harvest losses of fish, being supported by the Cultivate Africa’s Future (CultiAF) Fund, an initiative jointly funded by Canada’s International Development Research Centre (IDRC) and the Australian Centre for International Agriculture Research (ACIAR). This comes from a background that sub-Saharan Africa has the lowest fish supply per person of any global region, with supply predicted to fall by 20 per cent in the next two decades. Poor processing and management are major factors, resulting in losses worth up to 5 billion dollars each year. Narrowing it to countries, poor post–harvest handling of fish is said to contribute greatly to the declining per capita fish consumption in Malawi and Zambia. However, it seems to receive little attention. The project is therefore undertaking fish value chain analyses to understand post-harvest biomass losses, economic value and nu­trient content changes, and gender norms and power relations. “Some literature put post harvest loss figures at 30 per cent countrywide but western province could be slightly higher,” said Alex Chilala, Western Province Agricultural Coordinator, highlighting that the flood plain is a complicated area where fishers walk for as long as 25 kilometers to get to the harbour after harvesting their catch. Chilala, who is also the project site manager, told IPS that the interventions are therefore meant to minimize the losses for the community, which heavily relies on fishing for livelihood. “Most of those involved in fish processing and trading are women. And you can imagine the stress they go through walking long distances across the vast flood plain to the harbour. So the interventions are aimed at minimizing the losses they incur in the process”, added Chilala, who stressed that the gender dimension is key feature in the fish value chain that the project is trying to understand and strengthen. Working with fishing communities in the Barotse flood plain (Zambia) and Lake Chil­wa (Malawi), and other partners, the research team has devel­oped pilot interventions to reduce the identified losses. Dr Kate Longley of WorldFish believes conducting participatory research has some important advantages over other methods of technology introduction. Typically, fish processors in the area preserve their fish through sun-drying or smoking, and small quantities of fish are sold fresh. However, the processing results in the fish becoming very brittle and easily damaged during transportation, among other losses, destroying the quality and value of the fish. There are four technologies being tried, among which is solar tent drying. a technique where a tent made from plastic sheeting is used. These have the advantage of protecting fish from dust and flies during the drying process and speeding up the time for fish to dry due to elevated temperatures. “Apart from materials being locally available and cheap, solar dryers have the advantage of elevated temperatures for fast drying and an assurance of a clean end product,” Robert Lubilo, Chief Fisheries Training Instructor, told IPS. “Salting is an ancient method but people here in western province don’t use it. This makes fish firm and dresses the prevailing challenge of fish fragmentation”, said Lubilo. And fish trader Sichali knows the value of salting. “We used to lose a quarter of our stock due to breakables during transportation especially over long distances. But now we have learnt salting, salted fish does not break no matter what,” said a visibly delighted Sichali. Sichali, who now belongs to a cooperative of fish traders in the area – one way of minimizing losses through aggregation – thinks the heavy post harvest losses that fishers incur force them to resort to destructive fishing methods and refusal to observe the fishing ban that the government has imposed to allow for breeding of fish. With the other two technologies: the Choka-Kiun (which uses less firewood for fish smoking) and promotion of the usage of ice, which is not common, and the soon to be established ice plant by the private sector supported by the project, the fishing community in Western Zambia could be harvesting their way out of poverty.